Supply Chain Recruit was the first jobs board that we developed, back in 2002. Now in its 17th year, we are pleased to announce its fourth re-launch and revamp. As an “old” jobs board, Supply Chain Recruit had different issues to contend with, in comparison to a new jobs board. It already had good search engine positioning, but the old website was not mobile compatible and was not secure or GDPR compliant. He was also being targeted by their competitors, so to keep ahead of them as the leading jobs board, he simply had to upgrade and upgrade quickly. We had to ensure that the changeover was smooth for his candidates and clients while also avoiding his website being penalised by Google. We were able to use our 301 re-direction tool to remap all of his old URLs and the website was switched from preview to live, within 24 hours. Not only have their search engine positioning been retained, they have also been boosted. They now have page 1 positioning across a large range of search phrases. The new website was built using our very latest jobs board system, which is secure, responsive and GDPR compliant. 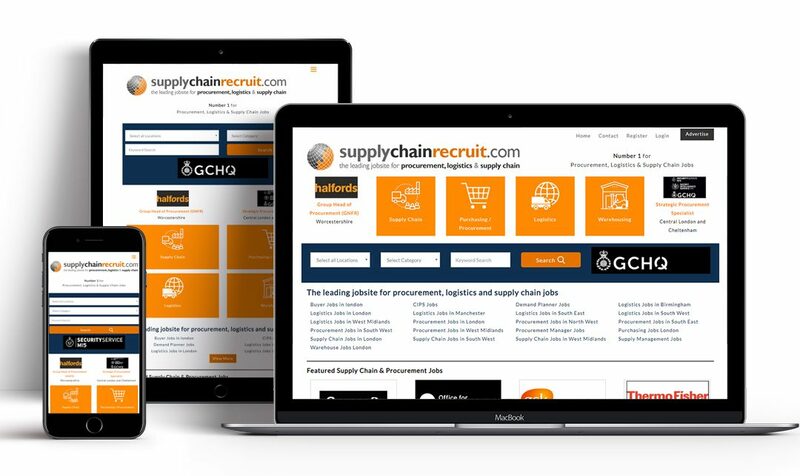 Launched in 2001, Supply Chain Recruit were the UK’s first specialist job board in the procurement, logistics, and supply chain sectors, with more than 17 years setting the standard, they are the most experienced specialist job board in these sectors. SupplyChainRecruit.com is the UK’s Number 1 jobs board for Procurement, Logistics & Supply Chain Jobs. With in excess of 100,000+ active supply chain professionals, 6,000+ advertisers and hundreds of applications on a daily basis, Supply Chain Recruit is an extremely busy and active jobs board system. They are the only jobs board operating in the procurement, logistics, and supply chain sectors to be a member of the International Association of Employment Websites – and to adhere to their standard in terms of quality and performance. Four times finalist of Niche Job Board of the Year, SupplyChainRecruit.com are the only jobs board operating in the procurement, logistics, and supply chain sectors ever to be recognised as a “What Jobsite” Accredited Jobs Board. Candidates, register your CV to get your details matched to the best available jobs and get sign up for their free job alert service to get all the latest supply chain jobs direct to your inbox. The website also offers career advice for your supply chain and procurement career. SupplyChainRecruit.com deliver exceptional talent at professional and senior levels – individuals with very specific skill and experience profiles; key people that are difficult to identify and attract via traditional recruitment channels. They connect employers with outstanding supply chain, procurement, and logistics professionals across the UK and beyond helping employers to succeed with their self managed recruitment campaigns without the need for a recruitment agency. Some clients have trusted them with their assignments for over 15 years. Honesty, advice, performance, commitment, and value. That’s it.